University campuses are busy places for wireless client traffic coming from Wi-Fi connections and other wireless devices that contend for the 2.4 GHz frequencies space that most campus Wi-Fi networks use currently. This is making the 2.4 GHz frequency unsuitable for Wi-Fi connection due to too much interference from other devices as well as from Wi-Fi connections themselves. TV white space could provide a suitable alternative to campus Wi-Fi networks because of its better signal propagation characteristics as compared to 5 GHz frequencies, which is currently being used as an alternative. 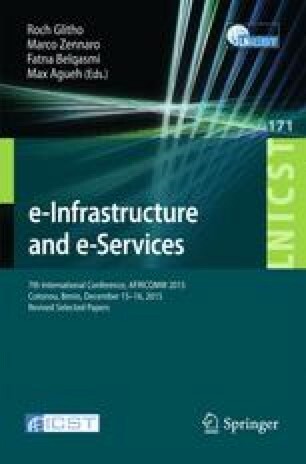 As a first step towards white space management to prepare Africa’s university campuses networks for the migration from analog to digital TV, this paper presents the results of an investigation that was conducted to look at the spatial distribution of white spaces frequencies around two university campuses in Cape Town-South Africa to assess if they are useful enough to be used for university campuses to complement Wi-Fi networks.